The giveaway is now closed. Thanks to ALL who visited and entered. The winner has been announced here! Hello, and welcome to the kick-off day of Blogathon Canada 2013, an annual event brought to you by Sew Sisters Quilt Shop. Holly from "Holly's Red Bike" and I are privileged to be representing B.C. in the blog hop this year. Be sure to check out her blog as well! I have always been a crafter but I have not always been a quilter. I began teaching myself how to sew about 4 years ago and I haven't looked back! I started sewing bags, household/kitchen-y items, aprons, etc., before taking the plunge into quilting. Since then I have covered every bed in our house (and other people's houses!) with quilts, I make quilts and quilted items for gifts, and I have enjoyed participating in several online bees, making quilt blocks for donation projects. The local quilting scene where I live is really lacking as far as modern quilters and modern fabric goes. An attempt was made to start up a modern quilt guild here but we just couldn't make a go of it, which is sad. For this reason, and also given that I'm a bit of an introvert, I am so thankful for the online quilting community, in which location doesn't have any bearing on finding like-minded friends!! Let me show you a collage of some of my favourite projects from the last few years, and please feel free to stay and browse around! Would you like a chance to win something?? Sew Sisters Quilt Shop has graciously provided this sweet prize pack for me to give away to one of you. 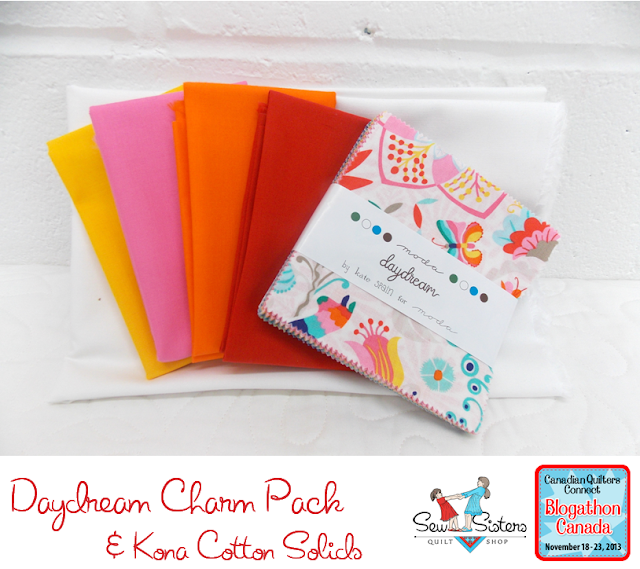 Included is a charm pack of Daydream by Kate Spain, 1 metre of Kona White, and 4 Kona fat quarters in coordinating bright colours. The giveaway is open to everyone, not just Canadians! To enter, leave a comment letting me know which country you're from, and I will draw a winner at the end of the Blogathon using a random number generator. In addition to that, Aurifil is going to be sponsoring a thread giveaway at Sew Sisters blog so be sure to pop over there for a chance to win! There are many wonderful B.C. quilt/sewing blogs, and here is just a sampling to get you started. I am in crazy love with your Swoon - the colours, oh the colours!!! Gorgeous. I am from Canada - BC in fact!!! Thanks for the chance. Hi Heather! I think you might know I'm from Australia, specifically Melbourne- (the last capital city before Tasmania) and the world's most liveable city! I envy you living on Vancouver Island! I visited there in 1980! It is a beautiful part of the world! I'm in the UK but i wish i lived in Canada!! I live in Sydney Australia. Your quilts are gorgeous, particularly your Roller Rink! Thanks for the lovely giveaway. I've been following you for a while but it's nice to learn more about you - your quilts are fabulous, especially the Swoon and the top right one!! Thanks for sharing your pretty projects. I'm in the USA & I really enjoyed last year's Blogathon Canada. I am from the US and live in Kentucky. This is my first visit to your blog and I love your quilts! Fabulous giveaway, thanks for the chance to win! I'm Canadian - from the beautiful city of Montreal but currently living in northern Alberta. We visited Vancouver Island a few years ago and it's gorgeous - hope to get there again next year. I really like your roller rink quilt - comma is such a fun fabric line! Thanks for the chance to win Kate Spain's great fabric. I am from the US and live in North Carolina. I've been reading your blog for a couple of months and am so glad I found it. I am a big fan of your quilting style and look forward to your posts. Thanks for the chance at the giveaway! So nice to meet you Heather...I am in new Brunswick. Your quilt projects are fantastic!! Your quilts are just amazing. "Roller Pink" is just wonderful. I love how you quilted it. I live in Halifax, Nova Scotia. I love your 'Hometown Reunion' quilt! Fun!! I'm from Ontario, Canada and am excited to find more Canadian quilt bloggers! Dead centre of Canada, here. You have lovely quilts! I'm kind of a loner here too in that I'm an art quilter where there are no others. I belong to a regular guild. I love your choice of fabrics! What a sweet quilt it would make. Your work is beautiful - I am in awe! I am in the UK, and visited Vancouver on my honeymoon - LOVED it! Such beautiful work! I am from Maine in the U.S. Thanks for the giveaway! I'm from the USA. Loving that we can all see what the world is doing at a click. such great quilts! I'm from Canada. Thanks for the chance! From the other end of Canada, in Nova Scotia, it's such a pleasure to see what quilters are up to in B.C. - such lovely quilts and a lot of inspiration. Hi Heather, nice blog!! I am glad you decided to host the Blogathon, so I had a chance to know you, your blog and come here ore often to see what you are up to. I am originally from Brazil, but I live in Canada now. I live in Alberta, and thank you for the chance to win. I do love seeing all your beautiful quilts. Good morning heather! Beautiful collage of your work - love the brightness of everything! Love seeing all your quilts again in the collage - sooo pretty! I'm from the US! I'm Canadian as well. :) Thanks for the chance! I follow your blog and I am from Napanee, Ontario Canada. Tks for the chance to win :-) !! I so enjoy your blog and love to see your creations! Thanks for a chance to win! Such a beautiful collage! I'd be hard pressed to pick a favorite. I'm in northern MN and love the online community of quilters too. I live in Manitoba. 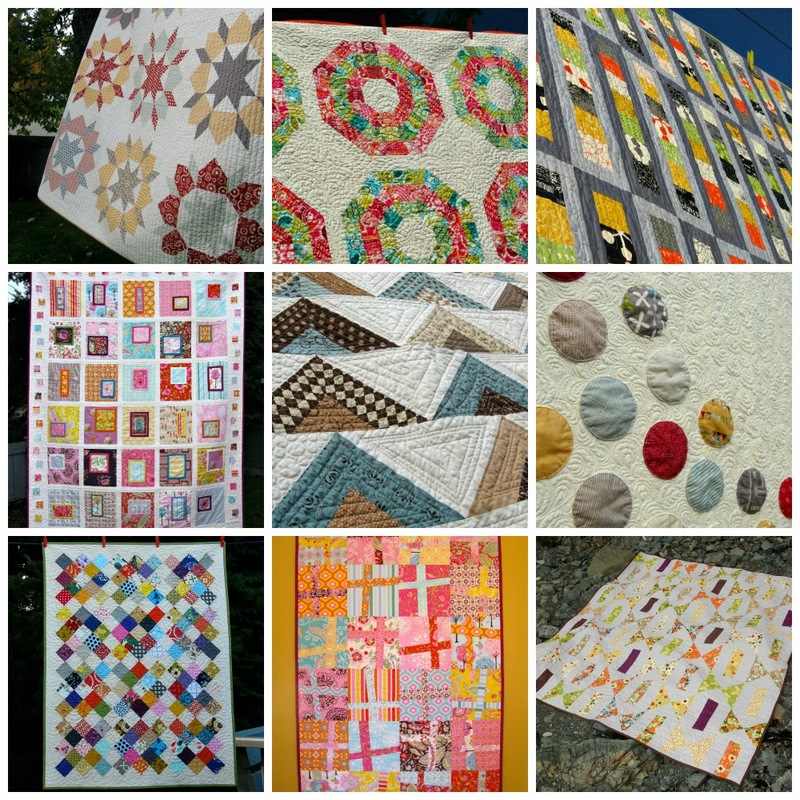 Thanks for sharing your quilts and hosting other bloggers. Always good to hear what other quilters are doing. I love your quilts. You are right the internet is great for finding your quilt people! Your quilts are absolutely beautiful and one of my favorite is your Swoon. From Murcia,Spain.Thanks for the chance! I would have come to your Modern Quilt Guild meetings :) Sadly, the same thing would happen in my town if I tried to start one. I'm also an introvert and so grateful for the online quilt world. Thanks for the giveaway, Heather! I'm from the US and currently live in NS. Would love to win this bundle! I just love all your quilts!! Wow! I have always wanted to live on the island, maybe someday !! Good to "meet" you ! Your quilts are gorgeous! I'm a quilter from Calgary, AB. Thanks for the great intro to your blog. I love your swoon quilt! I am a quilter from Calgary, AB. I have bookmarked your blog. I love meeting new Canadian quilters. Hi Heather! Love seeing the mosaic of so many of my favourites you made! Cheers from Saskatchewan as we head to the Grey Cup!!! Lovely quilts Heather! I love the on-point, small patchwork. I'm a recent transplant to Montreal, Canada. What a great opportunity to discover Canadian quilting blogs! HI, it's Heather from Ontario. Glad to be joining in the blogathon this year. Love your selection of fabrics, brights make me smile. I'm a fellow Canadian from Westlock, Alberta. My husband would love to live in BC as the climate is more like his native Holland. We have relatives there, so we make sure to visit so now and then. I live in Ontario in the Niagara Region. Beautiful bundle you have chosen. Great intro Post, this hop is going to be a blast! Love all your projects! Thanks for linking to my blog :) I am from beautiful BC too as you know. Grew up in Langley learning how to sew from my mom! I am a Canadian but live in the UK now. All my family are in the Ottawa area. I miss the snow!!! As you know, I am from Chilliwack, BC! I did not realize that your oldest is the same age as my oldest. Very nice give away. Would love the chance to win. I am from NB and my brother and his family lives on Vancouver Island. They have been there for over 20 years. I have been out a few times and really enjoy the island. Love your quilts. Very nice. Thanks for sharing. Loving your style here in sunny Israel. Such beautiful work, Heather! So happy to have you and Holly representing the West Coast!! And what a great giveaway from Sew Sisters! Your swoon quilt is beautiful! I love how I am finding all of these British Columbian quilters! With all of the snow we just received in Alberta, I could sure use some color to brighten up my day. There's a brand new MQG here, come on over! I'm from the US (WA) and spent a year living up in Blaine right across the border. I miss being able to pop in and out of Canada so easily! Hi Heather! It's great to be hosting along with you! I agree that the internet is a wonderful place to meet like-minded friends. I'm glad to have met you here and I look forward to meeting in person one day! I've been looking for a masculine way to quilt together some blankets I'm working on for my step-sons. I LOVE what you did with Roller Rink. So inspiring! I'm in Vancouver, and like you, relatively new to quilting too. I love the quilts you featured! Best wishes from Atlanta, GA in the United States! LOVE YOUR QUILTS,ESPECIALLY THE ONE OF "PURE" FABRICS! THANKS FOR SHARING A SWEET GIVEAWAY! I love your swoon quilt, it's beautiful. I just finished mine and need to quilt it. All your quilts are lovely, I'm from Montreal, nice to meet you. Beautiful quilts, I wish I had taken pictures of mine as I did them, but I see I need to start now. Never too late to change. I am Canadian and love to read about other Canadian quilters! Hi from the United States. I love the circles quilt...well actually i love them all. thanks for the giveaway. This is my first blog hop ... Looking forward to it! I'm a Canadian from Burlington Ontario. I teach quilting and have a long arm business. I just love your quilts. Born and breed in Beautiful BC, currently living in Chilliwack! Love your quilts and thanks for chance to win! Wow, you've come a long way in four years! Great work and love the modern flavour :-). I was in Victoria for a day last May on my way to Salt Spring Island to visit my Sister and fell in love with the island. Hope to return for a longer visit one of these days. I'm from Ontario and enjoying the Canadian blog hop! Hello Heather. I'm in Ontario, Canada. I love your quilts, especially the triangle quilt in the middle of the collage. I'm Canadian through and through, and love living in Grand Forks, BC, in the heart of Boundary country. Thanks so much for your blog - really enjoy it! And thanks for this giveaway. Bright colours are my "thing". Well done, Heather! Wonderful post and your quilts are amazing. I'm visiting from Caledon, Ontario - just North of Toronto. Hello! My name is Linda and I am visiting you from France! I know, lucky me! I am originally from the UK but took early retirement 10 years ago and moved to France. Thanks for the giveaway. I love all your quilts and am so inspired by your machine quilting! Hi Heather! So lovely to meet you. Thanks for kicking off Blogathon Canada! Wow. Gorgeous mosaic! Amazed that you have so many beautiful quilts under your belt, and that you're relatively new to quilting. Very inspiring! Beautiful quilts! I love the circle quilt and the quilting! I am from Ontario. I'm going to love this blog hop, I'm canadian and live in quebec. We don't have many quilt shops here on Montreal. I also started quilting a few years ago, not to quilt but rather to tell myself that my high school teacher was wrong that I could sew a straight line. 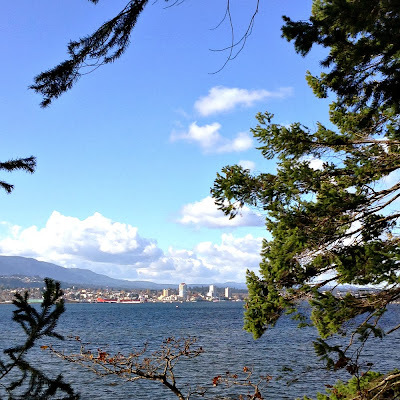 I'm from Ontario and had a chance to visit Vancouver Island 2 years ago - a beautiful place to live! Sorry to hear you couldn't get a modern guild going. Maybe in another year or two! You make beautiful colorful quilts. You also show lots of imagination. Hi I'm from Winnipeg mb, after moving to the city I've finished quite a few quilts and still many more to go, enjoyed your blog, thanks. This is Sue from Alberta. You have done some beautiful work on your quilts. We were just in Mexico, where I didn't see any quilting fabric. The colors in this giveaway package remind me of the market stalls there, so bright and happy! I am from Canada - Ontario. Your quilts are beautiful. Thanks for sharing. I live in Ontario, Canada. I'm from the US - Florida specifically. Thank you for a chance to win! I am from Ontario, Canada. 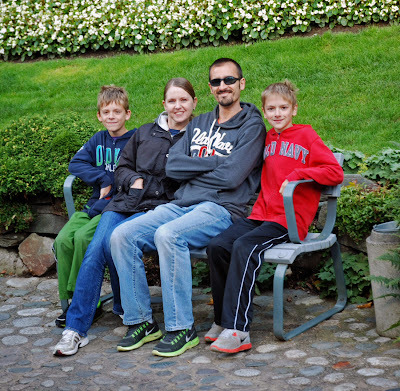 My sister lives in Nanaimo and we have visited Vancouver Island often and hope to visit again next summer for my nieces weeding. Howdy, im in Ontario. Been to BC a couple times, real nice. We have some amazing weather right now. Just took a break from studying, im taking diesel mechanics. I'm in the United States, in Massachusetts. Your quilts are gems. I also rely on the online blogging community for learning, ideas, and support since I don't belong to a guild. Lover your quilts. I am in the US, in Pennsylvania, but am looking forward to the blog trip through Canada. Thanks for organizing this. What fun to meet a whole new bunch of bloggers! Hi Heather. I'm in Nova Scotia and have made four trips to Vancouver Island in the past several years. We've really enjoyed exploring it. I've been admiring your Swoon quilt too, and am about to make one myself. Thank you for the chance to win this lovely bundle of fabrics. Love the fabric! Love to win it too. Looking forward to doing some 'blog trippin' across Canada. Hi. I'm from Southern Ontario. It baffles me how we are so much further south than Vancouver Island and yet you have such nice mild winter weather. Hi! I am from the US- Colorado! Thanks for the giveaway! Blog hops are such fun! Hi Heather! What a lovely post!!! Hi there. I'm a Canuck from TO. Love those quilts you've made. Great looking family too. I'm a fellow Canadian, from Prince Edward Island, but I have lived on Vancouver Island as well! Hi, this is my first blog hop. I am from Toronto, Ontario and I am lucky to live 5 minutes from Sew Sisters. Hi Heather! I am in Ontario, Canada! I am from Gisborne, Poverty Bay, New Zealand. Hello, I live in the USA. Love your quilts, very pretty. I live in N.B., Canada and love to quilt so of course I would love to have this great gift. thanks. I'm in the US, but one of my best friends is Canadian and she says I'm allowed to be an honorary citizen. :) Thanks for the chance to win! I'm in Canada - from Saskatchewan, but living in Calgary these days. Love to see your photo parade of quilts - lovely! Hi I'm in Sacramento, CA. USA Thank you for sharing your beautiful work. The online quilting community is a wonderful place isn't it. Your quilts are fresh and so colourful. Perhaps that giveaway will end up in my stash so I can create something fresh and colourful too. Great quilts! It's so fun to meet others who love fabric as much as I do. There's really no one else in my small town here in Newfoundland who is quite as obsessed as I am so blogging friends are wonderful. Hi Heather! I'm from Canada, BC to be specific, born & bred on the Island but now on the other side. Amazingly I've found some nice modern fabrics at the Fabricland in Courtenay when I've been over. Love your work, and so glad to get to know more on-line Canadian quilters! Gorgeous quilts! Thanks for sharing them... and for choosing such lovely Konas for your giveaway... I'm all the way at the other edge of Canada in Nova Scotia! Hi Heather. Lovely quilts. I am from southern Ontario. I'm another Canadian. I'm not surprised you make beautiful quilts - living in such a gorgeous part of Canada must be so inspiring! I'm Canadian and on Vancouver Island. Victoria is starting a modern quilt guild, so if you are close enough, please attend. Thanks for sharing your quilts and enthusiasm. I enjoyed taking a look around your blog,very nice! What a wonderful intro! I am Canadian through & through! You sure show some beautiful quilts! Thanks so much for a chance at the give-away! I'm from Boston, MA and one of your happy followers. I'm from Canada too - over in Vancouver. I'm trying to figure out from the picture where you are - Naniamo? (now I'm having moment about how to speak Nanaimo - gosh - I'm an island girl too). I really like your quilt with the stacks with the alternating greys. Apparently I'm also in the running for the longest run on sentence contest! Hi, I think your quilts are lovely. I grew up in Minnesota and currently live in Kansas. I visited the Thunder Bay area many years ago (30), it was very pretty. Live in the lower mainland. Thanks for a great giveaway! carli the quilter at gmail dot com thanks for the giveaway, I love solids and prints! I'm from Toronto, Canada and visited BC last year... and LOVED it!! Love the fabrics and am enjoying reading your blog. I love your quilts!!! Also love the giveaway!! Good luck everyone!! Your quilts are beautiful. I have really enjoyed seeing your roller rink develop! Love the comma fabrics! I live in North Vancouver! Hi Heather! I am a quilter from Eau Claire, Wisconsin - probably the only time I'll get to say "I'm south of the border" :-). Thus far, I've been mostly a traditional quilter; though I have recently seen some modern quilts that are on my to do list. Thanks for hosting - your quilts pictured a all beautiful! I love your color choices for your quilts. I have Swoon on my to do list as well. Thanks for sharing with us. Love your quilts...can't believe you have only been quilting such a short time as those are advanced quilts!! I also live on Vancouver Island...close to you...about an hour up island from you (Cobble Hill)! Aren't we lucky to live on such a beautiful island! Take care and thanks for the chance to win your lovely Give Away! great swoon. Thanks for the giveaway opportunity. Lovely pieces and thank you for sharing. I am from a little rural town in New York State. I've just dropped in from Scotland, where we have had our first snowfall this morning. You have done so much lovely work in four years. Greetings from Cape Breton!! BC looks beautiful. Love, love, love your work! Hi Heather. Love your Roller Rink quilt. I'm a fellow British Columbian. I love the colour contrast for you swoon quilt. Gives me a better idea how I want mine to turn out. lol. I'm from Ontario. Beautiful work. I love your colour choices. Hi, I am from the USA - I live in the state of Alabama. Isn't it amazing how addictive quilting becomes? Hello from Mid-Michigan--middle of the mitten! Love your work! We were in Canada a few years back and I loved what I saw of it. Hopefully will be back there early this spring on our way to Alaska. Thanks for a chance to win. I am from the USA. Live in the Bay Arean California. I'm your neighbor to the south (US)! Sorry to hear that you had trouble starting a modern guild; some ladies are starting one in this area. Give it some time, and try again! Hello from Eastern Ontario! Your quilts are so beautiful. Thank you for the chance to win. Home for me is Eugene Oregon in the beautiful Willamette valley. Thanks for the chance at that fun fabric. Awesome prize pick Heather!!! So nice to know you. One day we'll have to figure out a trip to the big smoke and visit to a VMQG meeting for you!! Im from Texas and I would love to win! I am in Toronto, Ontario, Canada. I love your quilts! Love your quilts, Heather. I went back to your previous blog entries to read about "Fussy Fairytales", since I was especially intrigued by it...great quilt! I'm a fellow Canadian living from Toronto. I'm in Alaska, on the kenai peninsula. love your circles quilt, beautiful quilting there!nice giveaway, thanx for the chance to win it. Just completed a Swoon quilt for a charity auction and loved making it. Beautiful quilts. Hi, I just love your quilts and I love the online community. I to live remotely in WV, USA thank you for a chance to win! This is such a fun hop. I am from the US. I live in the deep south :-) Thanks! I'm from Ontario Canada. Love your quilts, especially the one on the bottom left. I am from cape Breton, Nova Scotia, actually almost as far east as you can go in NS. Thank you for sharing and what a greeat give away. Your quilts are very pretty! I live in the USA. Thank you for sharing and for the great giveaway. Beautiful Quilts! I live in the state of Maine in the US! My story is quite similar to yours. Been crafting in Wisconsin for...ever. Just recently started quilting, and I love it! The colors in the fabrics that you are giving away are perfect for a quilt I have had in mind for a while now. Thanks for the opportunity!!! Beautiful colors in your quilting! I have been quilting for seven years and the addiction continues to grow. I am looking at creating my own patterns and taking that addiction further. Thanks for the great give-away opportunity... love the choice of fabrics. Greetings from Winnipeg, Manitoba! You've made some gorgeous quilts. Really am drawn to the hometown cushions you made. Will be stopping by often! Saskatchewan, glad to meet fellow Canadian. I'm from the US, Washington State to be exact. Almost neighbors, right? Love your quilts! I am from Northern Ontario, north of Lake Superior!! Thanks for sharing a little bit of yourself! You are added to my Bloglovin' feed... Can't wait to see what else you're up to! Great quilts! I'm from the US. Looking forward to this blog hop! Yay Vancouver Island! I'm down by the beach in Victoria. Nice to meet you and find your blog. Hi Heather. I live on Vancouver Island, too - how fun to "meet" this way. Your quilts are beautiful. Love your quilts! And I also love the online blogging community - it is so great to see what everyone else is doing and often how they do it!